When her beloved boyfriend Huck dies, Eloise is wrecked. All she has left of him are the texts that he sent: short, succinct - but full of love. Dan is travelling South America in one last hurrah before university and real life kick in. He's ready for love, but not of the casual kind. He's not met a girl that's set his world alight. But he's ready for her when she decides to make an appearance. One night on his travels, Dan discovers an abandoned phone. 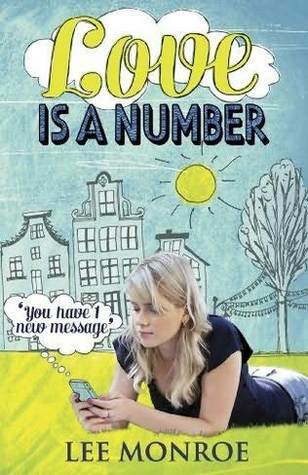 Despite the cutesy cover (and title), Love Is a Number is actually a pretty serious read that deals with loss, numbness and different stages of grief. Although I was prepared for some seriousness, having read the description in advance, I didn’t expect such an emotionally mature read. Lee Monroe is the author of the Dark Heart YA paranormal romance series so this foray into contemporary was pretty unexpected, but I do hope this is what she’ll keep doing. Anything else would be a pretty serious loss for teen readers. Huck, Eloise’s boyfriend of four years died suddenly while vacationing in Spain. The two of them always seemed to be the perfect couple: gorgeous, ambitious and very rich. With the loss of Huck, Eloise lost her entire future. Everything she had planned, be it in Uni or after, was centered around him. But as she goes through the stages of grief, she slowly comes to realize that there was a whole side of Huck she didn’t know at all and her own insignificance in his life strikes her as the betrayal of the worst kind. In Spain, Daniel is feeling the loss himself. His path and Huck’s crossed very briefly and they didn’t like each other at all, but seeing a young life disappear so suddenly is bound to leave some consequences. Dan is a bit awkward, a bit nerdy, smart and genuinely nice, and most of all, very lonely. When Huck’s phone accidentally ends up in Daniel’s hands, both Daniel and Eliose find something they sorely lack – comfort and closeness to another human being. At first, Daniel is reluctant to respond or give up the phone, but as they finally start communicating, they both experience radical changes. Despite the grimness of the beginning, Love is a Number carries a strong underlying message of hope that becomes more and more pronounced as Eliose goes through her emotional awakening and self-discovery. It’s hard not to pity her at the beginning, not only for the loss of her boyfriend, but for the numbness and discomfort she always feels, the estrangement from her parents and her (rather dishonest) friends. It is because of that that we cheer even more loudly when she decides to become more self-assured and assertive. All things considered, Love is a Number is a lovely, emotionally charged novel, perhaps a bit too heavy for hot summer days, but worthy of your time nevertheless. A copy of this book was kindly provided by the publisher for review purposes. No considerations, monetary or otherwise, have inflluenced this review. Great review! It sounds like this was more serious maybe than planned but still worth the read. Like Jen, from the looks of the cover- I never expected this to be a darkish read. I've been interested in this since I saw that cover and I'm really happy to hear that there is a lot more to it than just romance because I love serious YA contemps! Seems like quite a different kind of a contemporary, might have to give it a chance! I only just discovered this, and I quite like the sound of it. Even if it is a little more on the emotional and heavy side, I will have to give it a try one day. The premise has my attention. Thanks for sharing, Maja!